This page was last updated on April 4, 2019. Many of the industries in Utah have been large enough to be served by the major railroads in the state. A few industries were large enough early on, such as Utah Copper's Bingham Canyon copper mine, to have their own steam locomotives. In the post World War II era, one of the earliest industrial owners was Chicago Bridge & Iron when it bought a second-hand 20-ton Vulcan unit in 1949, as an Army surplus purchase. Utah Power & Light was another early user of its own locomotive. UP&L purchased a D&RGW GE 44-ton locomotive in 1954 to switch coal cars at its new Carbon steam power plant near Price, Utah. In 1958, UP&L purchased, as Army surplus, a Plymouth 20-ton unit, from the Salt Lake City Air Base, to switch coal cars at its Hale power plant near Provo. This second unit was moved to UP&L's Gadsby power plant in Salt Lake City in 1973 with the closure of the Hale plant. The completion of U. S. Steel's Geneva steel plant in 1943 brought with it three new GE 80-ton center cab switching locomotives, delivered in January 1944. More locomotives for Geneva followed in 1947 and 1948, and again in 1956 as Geneva continued to grow and expand it operations. Several other companies were large enough to need in-plant switching, which was usually done by the railroad that provided the inbound and outbound traffic at the time that rail cars were either picked up, or dropped off at each site. As the switching rates charged by the major railroads began increasing in the 1960s and 1970s, many industries began buying their own locomotives. Below are roster listings of the industries in Utah that are (or were) served by rail, and which owned and /or operated their own locomotives. a. The Leamington cement plant was built in 1980 by Martin-Marietta to furnish cement to the Intermountain Power Project in nearby Delta, which started formal construction in September 1981.
b. Martin-Marietta leased the entire plant to Southwestern Portland Cement Company in April 1984, then sold the plant to Ash Grove Cement Company in May 1989.
c. The first locomotive at the Leamington cement plant was the former Salt Lake Garfield & Western D.S. 3, a GE 45-ton center-cab switching locomotive, "drop-cab" style with side rods. It was built in 1944 as U.S. Army Transportation Corps number 8519, delivered to Hawkins Point, Md. ; used in France during World War II; rebuilt at Fort Hollibird, Maryland, later used at Fort Sill, Oklahoma, by September 1, 1960; stored at Defense Depot Ogden and Hill Air Force Base until sold as surplus to Houston Truck & Equipment Co. (dealer); sold to SLG&W on August 15, 1972; painted red with white stripes; sold to a dealer in July 1979; sold to Virginia Central at Fredricksburg, Virginia; sold to Pittsburgh, Allegheny & McKees Rocks Railroad at McKees Rocks, Pennsylvania; sold to S&W Construction of Provo, Utah, used during the construction of the Leamington cement plant; sold to Martin Marietta by March 1982. Broken Arrow provided switching service to the hazardous waste facility at Clive, Utah. From the company's web site (brokenarrowusa.com): "Quality & integrity since 1972. Serving the western united states for over 40 years. Specializing in bulk road salt, kiln-dried salt, construction services, plumbing, roofing and fire protection." From Bloomberg.com: "Broken Arrow, Inc. provides construction, mining, and excavation services. It offers roofing products; commercial flat roofing services; and general construction services. The company also processes perlite and gypsum, and calcium carbonate and silica minerals. In addition, it produces and distributes road salt for Idaho, Colorado, and Arizona places. Further, the company provides site work on projects services. It serves restaurants, convenience stores, and school districts. The company has a general contractor's license for the states of Utah, Nevada, California, Arizona, and Wyoming. Broken Arrow, Inc. was founded in 1972 and is based in Tooele, Utah." a. 242 may be ex U. S. Army 4023.
b. Broken Arrow leased (owned?) ex Utah Railway RSD-15 401 until it was donated to Ogden Union Station museum. The federal government gave the 1,118 acres of the former Defense Depot Ogden to the city of Ogden in 1997. The action was the result of the military’s Base Realignment and Closure process, and the former defense depot land was conveyed to the city at no cost. After taking ownership, and after a formal request-for-proposals, Ogden City entered into a long-term development agreement with the Boyer Company, a Salt Lake City-based real estate development firm. The result was a public-private partnership that transformed what was once called Defense Depot Ogden, into a successful master-planned business park, called Business Depot Ogden. Included in the transfer of ownership were all the buildings and facilities, including the railroad tracks and the single railroad locomotive assigned to the defense depot. Although the locomotive is on wheels and fully portable, it is seen as an asset and is part of the public-private partnership agreement. Between 2003 and 2008, Utah Central was under contract to provide railroad switching services to BDO, and used the locomotive to perform those services. In 2008, Utah Central was purchased by Patriot Rail and ended the use of the BDO locomotive, and began using a locomotive that it owned. According to the public-private partnership agreement, Boyer was to have developed 106 acres in the business park by the end of 2014, and 242 acres by 2034. But when three new buildings open on the northern end of the complex in 2017, there will be 320 total acres of new development in BDO. Defense Depot Ogden was closed as a government facility on September 30, 1997. After completing the environmental cleanup, ownership of the buildings and property passed to the City of Ogden in 2003. Business Depot Ogden was created as a public-private partnership operated by the Boyer Company, to manage the property. In March 1998, Ogden City received a federal grant for $2.4 million to make the needed repairs to the streets, and sewer and water lines within the former military base. Pending other agreements, the facility was being leased to the city. a. Built in February 1953 as Defense Logistics Agency 53205; assigned to Defense Depot Ogden, Ogden, Utah. b. Former Defense Logistics Agency (DLA) 53205 owned by privately-held Business Depot Ogden, which is the former Defense Depot Ogden. For several years, a former Defense Logistics Agency Fairbanks-Morse H10-44 was used by Utah Central to switch cars at the privately-owned Business Depot Ogden. The locomotive is owned by BDO and was used without proper authority. Replaced by a Trackmobile; donated in April 2011 to Utah State Railroad Museum at Ogden Union Station; moved on May 21, 2011.
c. Sources: Locomotive Notes II, Number 175, December 1993, page 13, reported by Bill Farmer and Don Bain; Norm Metcalf and Don Bain via email on February 21, 2007; builder data from Randy Keller. RSSX 436 and 7983 arrived at Chevron in Salt Lake City in about September 2004; RSSX 7983 came from Chevron's location in El Segundo, California. RSSX 4471 arrived at Chevron in Salt Lake City in June 2013; RSSX 4471 came from Huntsman Polymers (numbered as P-7), Odessa, Texas; out of service in July 1998, stored at Odessa plant; Odessa plant sold to Flint Hills Resources in 2007; plant closed in June 2009; locomotive P-7 sold to RSSX; used at other RSSX-served locations until moved to Chevron in June 2013. Railserve (RSSX) 4471 was built in 1951 as Chicago, St. Paul, Minneapolis & Omaha no. 155; renumbered to C&NW 155 after merger in 1957; rebuilt by C&NW Oelwein to GP7R 4471 in December 1979; retired by C&NW in 1992; sold to Kramer Diesel Supply, Hudson, Wisconsin; sold to Econo-Rail (ECRX; Trans Global Solutions) 4471 in December 1993; sold to Huntsman Polymers, numbered as P-7; out of service and stored at Odessa plant from June 1998 until sold to RSSX in June 2009; refurbished by RSSX and used in other locations until moved to Chevron in June 2013. Railserve (RSSX) 7983 was built in 1952 as Detroit Toledo & Ironton GP7 no. 955; sold to Illinois Central in December 1972 and rebuilt to GP8, numbered as Illinois Central Gulf 7983; to Chicago Central and Pacific 7983; to Railserve 7983 (history not complete); engine components failed and locomotive returned to Railserve for repairs, completed by MidAmerica Car in Kansas City and later leased to ADM in Valdosta, Georgia, before June 2015. Rail Management owned and operated up to fifteen shortline operations: AN Railway, L.L.C. ; Atlantic and Western Railway, L.P.; Bay Line Railroad, L.L.C. ; Copper Basin Railway, Inc.; East Tennessee Railway, L.P.; Galveston Railroad, L.P.; Georgia Central Railway, L.P.; KWT Railway, Inc.; Little Rock and Western Railway, L.P.; M&B Railroad, L.L.C. ; Riceboro Southern Railway, L.L.C. ; Tomahawk Railway, L.P.; Valdosta Railway, L.P.; Wilmington Terminal Railroad, L.P.; and Western Kentucky Railway, L.L.C. All but one operation were sold to Genesse and Wyoming Inc. in June 2005. The Copper Basin was sold to ASARCO in September 2006. Getting back to Rail Switching Services, the contract switching operations were sold to Trackmobile, Inc. in November 1995 when Rail Management decided that it wanted to focus its attention on the railroad franchise business. The twenty-two Rail Switching Services switching operations were handed over to Railserve, Inc., Trackmobile's own contract switching subsidiary and the locomotives that were already in operation for Rail Switching Services were leased to Railserve on a net lease by Durden Leasing. Railserve leased forty-three locomotives, forty-one on long-term leases and two on short-term leases. Clauses in the leasing contract allowed a locomotive to be returned to Durden Leasing, only when a contract was lost and the locomotive was no longer needed. By September 1999, one long-term lease unit had been turned back and both of the short-term lease units had too, leaving forty engines being leased by Railserve. A November 1999 or November 2001 purchase option was also in the contract, but the option was exercised on November 19, 2000 and Railserve acquired forty locomotives. Railserve has been the largest provider of in-plant rail services in the North America and offers the above mentioned contract railcar switching as well as unloading and loading services, locomotive leasing, car inspection and track repair. Railserve operates in nearly seventy locations in the United States as well as Canada. Rail Switching Services locomotives were painted bright yellow with a black underframe and black lettering. The lettering was most often a simple "RSS" and road number painted on the cab sides, but many early locomotives also had a black diamond painted around the identification (please note that "RSS" was not their reporting mark, as that mark actually belongs to the Rockdale, Sandow and Southern Railroad). Railserve adopted the same yellow and black paint scheme, but by 1997, marked their locomotives with "RS" (this was not their reporting mark either as that mark actually belongs to the Roberval and Saguenay Railway). Due to the need to have an actual reporting mark for moving locomotives from one contract to another, Railserve acquired the mark RSSX on November 30, 2000.
a. CB&I 180 was built as Quartermaster Corps 2082, assigned to Muroc Army Air Field (later Edwards Air Force Base), California; renumbered to U. S. Army Transportation Corps 7713, assigned to Pine Camp (later Camp Drum, and Fort Drum), New York; sold to Mississippi Valley Equipment Co. (dealer), located in St. Louis, Missouri. b. CB&I 180 was purchased in 1949 for use at its Salt Lake City plant, numbered as CB&I 180; still in Utah by June 1982.
c. Originally equipped with a six-cylinder, 175 horsepower LeRoi engine; re-engined by CB&I in 1951 with a Cummins six-cylinder, 200 horsepower engine. a. Circle 4 Farms 1200 was built as UP SW9 1848, rebuilt by UP to SW10 1848 in August 1979, renumbered to UP 1200 in March 1980; retired by UP in December 1997; sold in April 1999 to Boise Locomotive; sold in July 1999 to Diesel Supply, Hudson, Wisconsin; moved on 13 July 1999 to Columbia Basin Railroad at Yakima, Washington, for repairs and repainting; moved from Yakima to Delta, Utah, as DLSX 1200 during early April 2000; leased to Circle 4 Farms, Milford, Utah, where it replaced a wrecked TrackMobile; lettered as "Hog Express". Located adjacent to Nucor Steel at Plymouth. Western Metals Recycling, LLC (WMR) is a wholly owned venture of Cincinnati-based, The David J. Joseph Company (DJJ), one of USA's largest scrap metal companies. DJJ is also part of Nucor Corporation's family of companies. Headquartered in Charlotte, North Carolina, Nucor is the leading purchaser of ferrous scrap and the largest recycler in North America. Western Metals Recycling was formed in 1996 by combining Atlas Steel facilities in Salt Lake City, Ogden and Provo with DJJ's scrap processing plants in Plymouth and Denver. In 2000, WMR acquired Markovitz and Fox's Sparks, Nevada (Reno) facility, and 2011, opened a metal recycling plant in Albuquerque. In 2012, WMR acquired Van Gundy's AMPCO Grand Junction, CO recycling facility. In 2014, WMR acquired Sims Metal Management's Utah recycling facilities. Today, we operate nine recycling facilities in three states. Western Metals (SSRX) 1109 was built as MP 1109; to UP by merger in 1983; retired by UP in June 1985; sold to Precision National Corp., Mount Vernon, Illinois, on July 24, 1985; sold to Wilson Railway Corp., Des Moines, Iowa, August 1986, to be sold to U. S. Steel, Lorain Works 1109, April 1987, sale not completed, unit stored at Stevens Point, Wisconsin, during June 1990; sold to D. A. Walmsley and Company (DAWX) (Aug 1986? ); to Southwest Portland Cement (SWPX), Douro, Texas; to Cemex 1109 (same location) in 2000; sold to S&S Sales & Leasing (SSRX) in late 2011; leased to Western Metals ca. 2012. JTPX 1204 was built in December 1954 as Florida East Coast 230; to Newburg & South Shore 1201; to Union Railroad 586; to Lake Terminal Railroad 1204, at Lorain, Ohio; to David J. Joseph Co. as Joseph Transportation Co. (JTPX) 1204; leased to Western Metal Recycling in December 2001; Joseph Transportation Services (JTPX) purchased by Relco in June 2004. JTPX 1204 was sold by Relco to Big West Oil, North Salt Lake, Utah, in June 2014. In April 2007, two Department of Energy RS4TC locomotives were moved from DOE's site in Fernald, Ohio, to Moab, Utah for use during the movement of tailings from the site of the DOE site at Moab. They were never used and were stored at the far south (west) end of UP's Potash Spur (ex D&RGW Cane Creek Branch). In late 2011, both locomotives were trucked north to the DOE tailings disposal site at Brendel (Crescent Junction) for possible sale, or disposal by burial at the site. From April 2007 to late 2011, these two locomotives were located at Potash (the potash plant west of Moab on the Colorado River), at the west end of UP's former D&RGW Cane Creek Branch. Moved to Potash in April 2007 from the Department of Energy site at Fernald, Ohio. Planned use was as part of the rail movement of the Moab mill tailings. The facility manager at Moab reported that the two units were moved by truck in late 2011 from Potash to temporary storage at the Moab tailings disposal site at Brendel. Sold in August 2012 to Rocky Mountain Railcar Repair (RMRR) and moved by truck during November 2012 to their facility at Tooele, Utah, on the former Tooele Army Depot. These two units arrived in Utah in April 2007; they were still there in May 2012; by July 2012 they had been moved to Brendel (near Crescent Junction), Utah. As of late August 2012, both locomotives were reported as being sold to Rocky Mountain Railcar at Tooele, Utah. Opened in 1989 by a group of private investors. In September 1991, ECDC entered into a contract with Provo, in Utah County, to accept 80,000 tons per year of municipal waste. Operations began in August 1992. The location near Sunnyside is ideally located in the high desert, with low evaporation and low humidity. The facility itself is located on top of a 1,500 feet thick bedrock of shale, and not near any sources of ground water. The site serves to dispose of contaminated dirt in an approved and certified land fill located near East Carbon City, Utah, on the former D&RGW Sunnyside Branch. Majority stock and control of ECDC was sold in March 1993 to USPCI, a subsidiary of Union Pacific. At that time, the company was reorganized as ECDC Environmental, LC, which was 80 percent owned by USPCI and 20 percent owned by the original owning investment group. In December 1995, USPCI was sold its 80 percent interest to Laidlaw, a subsidiary of Safety Kleen, Inc.
Laidlaw was sold to Allied Waste Industries in 1996, and Allied Waste was sold to Republic Services in 2008.
a. ECDC reporting mark is ECXX. b. ECDC locomotives were leased from Nevada Industrial Switching (NIS), a subsidiary of Mid-Am Equipment. NIS was reportedly sold to David J. Joseph Co. as Joseph Transportation Co. (JTPX) in September 1999; JPTX was sold to Relco Finance in June 2004, meaning that as of 2007, the ECDC locomotives are likely being leased from Relco. e. ECDC 4431 was built as SP 5406, to SP 3884, to SP 4431; to Relco, leased to ECXX 4431.
f. ECDC 9628 was built as Reading 2778, to CR 9628; to Arizona & California (ARZC) 9628; to ECXX 9628; still in CR blue paint and lettered for ARZC in September 1996. Envirocare's Containerized Waste Facility is the first commercial low-level radioactive waste disposal facility in the nation to be licensed in the 21st century and the first new site to be opened and operated since the late 1970's. The facility is located in Section 32 of Township 1 South and Range 11 West, Tooele County, Utah, at Clive, a railroad station on Union Pacific's former Western Pacific mainline between Salt Lake City and Nevada. This area has been designated by Tooele County as a Hazardous Industrial Zone, and is home to two hazardous waste incinerators (one active, one being decommissioned) and a hazardous waste landfill in addition to Envirocare's operation. The Hazardous Industrial Zone is a 100-square mile area specifically zoned for hazardous waste operations away from populated cities and residential areas. The design and operation of the Clive commercial containerized low-level radioactive waste disposal facility meets or exceeds all requirements for waste form, packaging,and disposal operations. The Clive, Utah site initially accepted uranium mill tailings-derived waste from the former Vitro Chemical Company site in south Salt Lake City, Utah. This cleanup was conducted by the State of Utah and DOE under the Uranium Mill Tailings Remedial Action Project in 1988. After completion of the cleanup, 540 acres of the 640-acre site remained unused. The remaining area was then purchased by the owner of Envirocare of Utah. The facility has expanded in size and capabilities over the years, with Envirocare receiving a new license in June 2001 to dispose of classes A, B and C low level radioactive wastes. Flying J Oil, Inc., purchased its North Salt Lake oil refinery in 1985. The refinery was built in 1949 by the Western States Refining Company. By 1963 the refinery was owned by Frontier Refining Company, which operated the refinery as the Beeline Refinery. Frontier Refining Company became part of the larger Frontier Oil Company, and in about 1965, Frontier Oil sold the refinery to Husky Oil, which sold it to Flying J in 1985. Through a corporate reorganization, Flying J, Inc. sold the North Salt Lake refinery to the newly organized subsidiary Big West Oil, LLC, in 1998. Flying J Inc. (FLJX) 1 was built in January 1962 as Arizona Public Service Company (APSX) number 1, assigned to Cholla, Arizona; sold to National Railway Equipment (NREX); leased to Gary-Williams Energy's Landmark Refining Co., for use at their oil refinery near Fruita, Colorado (the former American Gilsonite refinery), refinery closed in late 1992 or early 1993; leased to Flying J and moved in February 1993 for maintenance to Relco shop at Geneva Steel; later sold to Flying J, in service as NREX 1 as late as May 1995; Flying J refinery (and locomotive) sold in 1998 to Big West Oil, a subsidiary of Flying J.
b. Big West Oil (FLJX) 2 was built in December 1954 as Florida East Coast 230; to Newburg & South Shore 1201; to Union Railroad 586; to Lake Terminal 1204; to David J. Joseph Co. as Joseph Transportation Co. (JTPX) 1204, leased to Western Metal Recycling in December 2001; Joseph Transportation Services (JTPX) purchased by Relco in June 2004; JTPX 1204 was sold by Relco to Big West Oil in June 2014 and delivered to their North Salt Lake refinery on July 1, 2014, still in JTPX green; to be repainted to a new Big West Oil scheme during 2015. Big West Oil (RSSX) 7016 arrived at the North Salt Lake refinery in May 2012, purchased direct from RailServe, Inc. RSSX 7016 was built as GTW 7016, and was sold to RailServe in January 1989. In May 2012, the locomotive was rebuilt for Big West Oil as a RailServe LEAF Genset locomotive, replacing its original 1200 hp EMD 567 engine with a Cummins QSX15-L3 600 hp generator set. 1. Big West Oil (RSSX) 7016 was sold in November 2014 to Ash Grove Cement in Midlothian, Texas, with RailServe acting as point of contact for the sale. In-plant switching at Kennecott's Garfield refinery and smelter, contracted since 2002. 1. Nucor Steel 341 was built as P&BR 341; sold to Striegel Supply and Equipment (dealer) circa October 1979; sold to Nucor Steel, Plymouth, Utah; out of service at Nucor by September 1989; scrapped before 1992. 2. Nucor Steel 1000 was out of service by September 1989; scrapped before 1992. Nucor Steel 664 (1st); chopped nose; frame number 5072-9; built as CB&Q 208; to BN 1564; to Iowa Railroad via Dakota Rail Car; Iowa Railroad bankrupt in November 1984; ownership to UP as part of Iowa Railroad settlement; sold for scrap to Durbano Metals, Ogden, Utah, in November 1987 (along with four other former Iowa RR locomotives); sold for scrap to Nucor Steel in about September 1990, placed into service as Nucor 664; sold to S&S Shortline in August 2010; sold to Carolina Coastal Railroad (CLNA) in Wilson, North Carolina, in October 2010. Pacific States Cast Iron Pipe Co.
b. The PSCIP NW2 was purchased from Union Pacific on March 10, 1985, immediately after Union Pacific had retired the locomotive. c. The PSCIP NW2 was used at their Provo plant until donated to Heber Valley Railroad in September 2007; moved by very large, heavy-haul truck from Provo to Heber (Charleston) on September 13, 2007; as of September 2009, no. 1043 was undergoing refurbishment at Heber. d. The PSCIP RX500 locomotive was first seen on July 2, 2007, along with the NW2 out of service nearby. f. The Republic RX500 has an AC traction system, with up to 50,000 lbs of tractive effort (equivalent of an SW1200). Rocky Mountain Locomotive Services, Inc.
Rocky Mountain Locomotive Services began in June 2008 as a provider of locomotive and car repair and inspection. Peterson Industrial Depot is located on the former site of the closed Tooele Army Depot, and includes approximately 44 separate buildings containing approximately 2.3 million square feet of industrial/warehouse space, a rail service business that provides rail services and access to tenants at Peterson Industrial Depot and an approximate 288,000 square feet of separate storage unit space. 1942 -- Tooele Army Depot (TEAD) was established in 1942 in an area with a historical tradition of Indian cultures. Early Desert Archaic Indians inhabited the Tooele Valley and probably some portions of the Depot some 11,000 years ago. The Goshute people, who currently inhabit reservations in the surrounding area, are descendants of the Numic speaking culture. 1993 -- In March 1993, part of the site (1,663 acres) was placed on the Base Realignment and Closure (BRAC) list. As a BRAC site, 41 acres were transferred by the U.S. Army for private use in 1996. The remaining 1,622 acres of the BRAC parcel were transferred to the Redevelopment Agency of the city of Tooele in January of 1999. The property was subsequently sold by Tooele City to a commercial developer. 2013 -- The Ninigret Group, LLC acquired the real estate property known as Utah Industrial Depot ("Ninigret Depot") which consists of developed, partially developed and undeveloped industrial land and buildings located in Tooele, Utah. It includes approximately 44 separate buildings containing approximately 2.3 million square feet of industrial/warehouse space, a rail service business that provides rail services and access to tenants at Ninigret Depot and an approximate 288,000 square feet of separate storage unit space. 2013 -- Peterson Holdings strikes deal with Ninigret Group to become the property management company of the Ninigret Depot. Peterson Holdings is the parent company of Utah Fabrication, Rocky Mountain Railcar Repair, Tekko, and Grandstaff Electric who are all tenants on the Depot. 2014 -- After successfully managing the Ninigret Depot for the past year, Peterson Holdings decides to purchase the property and assets of what were previously known as Utah Industrial Depot. Peterson Industrial Depot was born out of need for better commercial, industrial, and rail served buildings In Tooele County. PID aims to be the game changer in Utah with the best pricing, with the best service, managed by the best team. The two locomotives were sold in August 2012 to Rocky Mountain Railcar Repair (RMRR) and moved by truck during November 2012 to their facility at Tooele, Utah, on the former Tooele Army Depot. These two units arrived in Utah in April 2007; they were sold in August 2012 to Rocky Mountain Railcar at Tooele, Utah. a. Amoco's refinery was switched by UP until the UP-SP merger in 1996. Utah Railway then took over the interchange and in-plant switching as part of BNSF's access to Utah markets as competition to UP; Utah Railway was (and still is) BNSF's contract service provider in Utah. 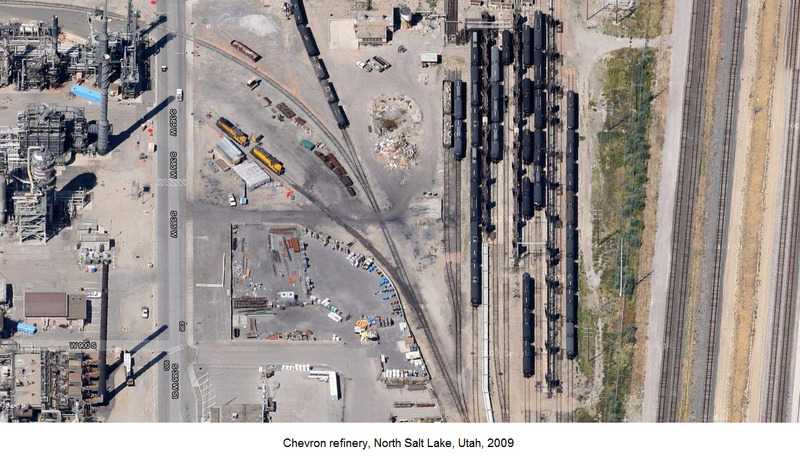 With Tesoro's purchase of the Amoco refinery in 2001, Utah Railway continued to provide access and in-plant switching (job RUT312) until the completion of UTA's FrontRunner North commuter rail, which cut the connection and access at 1700 North in July 2007.
b. With the completion of UTA's Frontrunner, interchange access to Tesoro is now by way of a connection between UP and UTA at 1700 North. UP switches inbound and outbound tank cars for Tesoro after receiving permission from the UTA dispatcher to cross the double-track UTA mainline. The switchers used by Tesoro after 2007 were (and still are) stationed at the south end of the Tesoro rail yard, at about 900 North. LTEX 1125 was ex Geneva Steel (GS) 1125; used at Geneva Steel from November 1986 to June 2007 when it was sold to Larrys Truck Electric (LTEX) and moved for lease to Tesoro's facility; not used by Tesoro, with Utah Railway still doing the in-plant switching; moved from Tesoro to UP's North Yard in Salt Lake City in mid August 2008; moved to LTE at MacDonald, Ohio, late August 2008. Rail Link (RLIX) 1005 arrived at Tesoro's facility in late June 2008. Galveston Railroad (GVSR) SW1001 301 was repainted and renumbered to Rail Link (RLIX 1005) in early May 2008; moved to Denver then to Salt Lake City during early June 2008, seen en route passing through Monument, Colorado, on June 5, 2008. Galveston Railroad was purchased by Rail Link's parent company Genesee & Wyoming in June 2005. RLIX 1005 was removed from service in January 2017 upon the arrival of the two GMTX locomotives. Rail Link sold RLIX 1005 to S&S Sales & Leasing (SSRX) in January 2017, with the locomotive becoming SSRX 1005 as the result. On February 22, 2017, RLIX 1005 was seen off Tesoro property, as part of a UP train, just behind the locomotives, sitting in UP's North yard in Salt Lake City, and the next day was moved to the former D&RGW Roper Yard. 3. GMTX 154 was built in June 1973 as NdeM 1022; to TFM 1022 (after June 1997); to Kansas City Southern de Mexico (KCSM) 1522 (in 2005); to GMTX 154. On a visit in October 2006, Norm Metcalf found that the locomotive was still marked for KMGX 57-602, SD9, frame number 5381-6. On the long hood, "Twin Mountain Rock" spelled out on the hood side, with "A Kiewit Co." located below. The locomotive had a sticker from April 1998 when Omnitrax rehabilitated the locomotive for Kiewit. The KMGX reporting mark was originally assigned to Kiewit Mining Group, which was split off in 2000 as Kiewit Mining Company, then sold to Rinker Materials in 2002. The reporting mark is now assigned to Twin Mountain Rock Co., as a subsidiary of Rinker Materials. The quarry at Milford, known as Twin Mountain Rock, was first operated starting in 1998 by Peter Kiewit & Sons, which spun off its quarry business as Kiewit Materials, which in-turn was sold to Rinker Materials in September 2002. Rinker Materials, one of the largest suppliers of crushed stone and concrete products in the U.S., with several quarries nationwide, some of which also use the Twin Mountain Rock name. In July 2007, Rinker materials was sold to Cemex. Locomotive was offered for sale during January 2013 by Ozark Mountain Railcar. 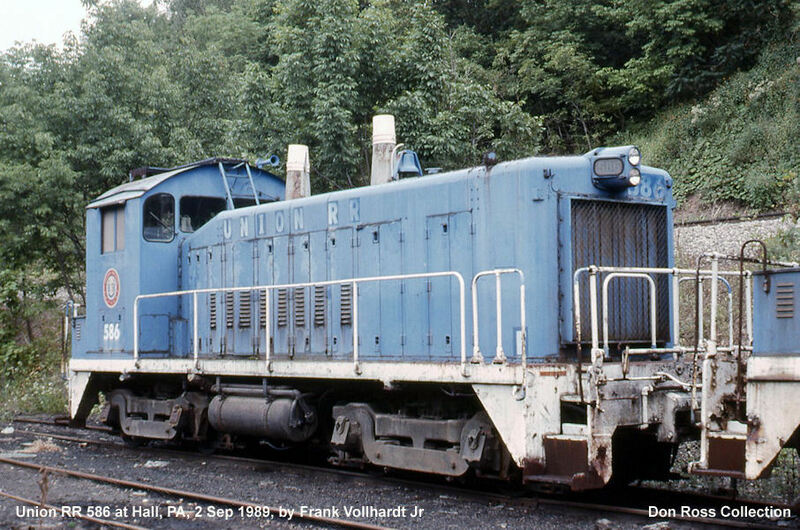 a. Twin Mountain Rock number 602, painted blue and white, with white number 602 on cab side; sublettered as 57-602.
b. Built as SP 5377, to SP 3855, to SP 4331; to OmniTrax, to California Northern 203, returned to OmniTrax Leasing (OMLX) as 203, leased to Kiewit Mining Group (KMGX) in April 1998. (information from Ken Ardinger and Norm Metcalf). Both units were sold to Ophir Mineral and Aggregate Group (Omag) in May 2007; with plans to use them on the Tintic Southern Railroad, a new shortline railroad planned to operate over UP's former D&RGW Tintic Branch, which UP calls its Tintic Industrial Lead. The new road hoped to serve the Keigley limestone quarry at Santaquin. Both units were moved in 2007 for storage to the dolomite facility at Flux, on UP's Ellerbeck Branch south of Great Salt Lake near Grantsville. During summer 2015, copper thieves stole the external copper cables, making the two locomotives totally unserviceable, with costs to rebuild being too high for old locomotives. The two locomotives will likely be scrapped. As of early 2016, both units were apparently sold as assets of the bankrupt Omag and its failed Tintic Southern Railroad. The plans for Tintic Southern included the operation of two rare Alco switchers that had been saved from the scrapper's torch. USS no. 1 is an Alco S-6 built in 1957, spending its entire service life at the Wellington wash plant. Painted all-black. USS 1217 is an Alco SSB-9, the cab unit of a unique cow-calf set built in 1956 for U. S. Steel's Oliver Iron Mining operation in Minnesota. The 1217 came to Utah in about 1981 when U. S. Steel closed the Oliver Iron operations. Painted all-yellow. U. S. Steel closed the Wellington plant in 1984 when they also shut down their nearby coal mine, along with their Carbon County Railway subsidiary. U. S. Steel sold their coal mine and coal washing plant to Kaiser Coal in 1985, and Kaiser continued to operate both until 1989, when they sold the Wellington facility to Castle Valley Resources as a loadout location for their Genwal Mine in Crandall Canyon. Both Alco locomotives were owned by Ophir Mineral and Aggregate Group, usually known as Omag. Omag's president, Al McKee, had noticed the two locomotives sitting at the Wellington location in about 2002. The locomotives were owned by NEICO (Nevada Electric Investment Company), parent company to Nevada Power. Mr. McKee had done some work for Nevada Power at their Reid Gardner coal-fired power plant at Moapa, Nevada, and had some contacts within Nevada Power. He contacted them in January 2007 about buying the two Wellington locomotives and was told that the locomotives could not be moved over UP tracks because they had solid bearings (also known as friction bearings), instead of the needed roller bearings. McKee wanted the locomotives to switch rail cars at his Omag facilities at Flux, Utah, where they load salt into rail cars, and at Wendover where they load gypsum for use as a soil amendment. Omag purchased both locomotives in May 2007. Union Pacific agreed to move the former USS 1217 to Flux, but only after a very extensive inspection. The move took place in September 2007. In September and October 2007, Al McKee moved the two locomotives to his Omag shop at Flux, on the former WP branches west of Grantsville. Omag planned on repairing and repainting the 1217 upon its arrival at Flux. At one time, UP would not approve the movement of the old USS no. 1, so Omag made plans to move it by flatbed truck to Payson where they will repair and repaint it for use at their Keigley facility at the former Geneva Steel Keigley quarry west of Santaquin on UP's ex D&RGW Tintic Branch. At Keigley, Omag loaded limestone (calcium carbonate) into rail cars, and planned to use the former USS no. 1 at that location. After loading the cars at Keigley, Omag will move them to over UP's former D&RGW Tintic Branch to a connection with UP's mainline at Springville. But instead, the locomotives was moved on a flat car to Flux. During summer 2015, while the two locomotives were stored at Flux, and after the failure of the Tintic Southern Railroad in spring 2015, copper thieves stole the external copper cables, making the two locomotives totally unserviceable, with costs to rebuild being too high for old locomotives. The two locomotives will likely be scrapped. As of early 2016, both units were sitting out away from the Broken Arrow facility at Flux, apparently sold (or about to be sold) as assets of the bankrupt Omag and its failed Tintic Southern Railroad. b. These three locomotives were used in the construction of the Geneva steel plant for Defense Plant Corporation, and likely did not remain in Utah after Geneva was completed in 1943. Utah Power & Light Co.
a. This information is from Utah Power & Light property accounting department on September 23, 1982.
b. Utah Power & Light leased SLG&W D.S. 3 for in-plant switching at Gadsby from January to December 1978. 1. Purchased second hand from Denver & Rio Grande Western in August 1954; for sale in July 1975; retired in January 1976; sold to Chrome Crankshaft of Illinois. 2. Purchased from Utah Metal Works, Inc., (located at Hill AFB, Utah at time of purchase); sold to Chrome Crankshaft of Illinois. 3. Purchased second hand from Denver & Rio Grande Western in April 1977.